One of the top most vacation spots to include in your itineraries is Europe. This continent is the most enticing and exciting place to visit because of the many scenic spots that a lot of people will surely enjoy going to. Travelling through the continent is a means for you to enjoy your being a tourist. This is the most ideal thing to do to enjoy your holiday vacation, along with your family and friends. Travelling in Europe is such a lifetime experience that can be enjoyed by many people. Once you have travelled on the place, you can be surprised with the natural and manmade treasures that can impress you along with the rich heritage. The great civilizations are seen that still flourish until these days. The Coliseums and Parthenons are a constant reminder of the western civilization that is embedded in the roots of the world. One of the best ways to further experience Europe is to mainly travel around the continent. More so, there is a need to be prepared in order to make the experience a memorable one. We would like to give you some useful hints and information how you can create your best driving tour with our special know how. 1. First of all plan not too much! For example if you choose the drive via the "Romantik Road" from Rothenburg to Fuessen, its appr. 250km or 160miles but you need at least 5 hours driving time without any stops. Another example is the drive from Grenoble to Nice via the "Route Napoleon" which is 350km or 220miles only but you need at least 7 hours driving time. You see - less is much more for your best European tours! We would like to offer you the unique opportunity to travel throughout Europe as a tourist, but taking advantage of the experiences of those who live here. In comparison to a guided bus tour, a self-drive tour offers you the opportunity to visit the sites and attractions that interest you most and to decide for yourself how much time you would like to invest there. In our information packet we make more suggestions on what to see and do than you could possibly realize in the time you have available. This is done intentionally to give you the choice without wasting precious time searching for the things that interest you. You can be sure that your accommodations for each night have been arranged in advance and that they will be up to the high standards you expect. During your entire tour, we are only a phone call away to help you with your travel plans or in case of an emergency. 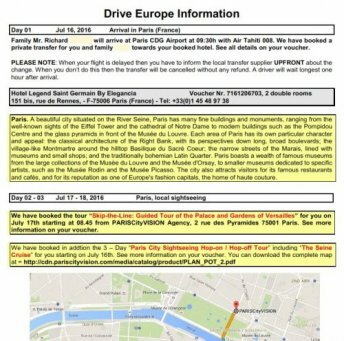 So start and plan you driving tour vacation in Europe and check out or sample tours or send us the Customized Tour Request for the Best European Tours. We are back! It was a wonderful trip, relaxing and full of adventures and surprises. I do not have to tell you once more that you are the "Grand Master" of travel. All the hotels, reservations, sightseeing and schedules were perfect. Your suggestion of using the services of a local guide, (although, as you know I like to drive), was perfect because the access to the villages and points of interest, was through very steep narrow streets. There was a lot of history and places to see, that I am not so sure that we could have enjoyed without the services of "Edgar" from Lisbon to Porto. Hubertus, this a small summary of our adventures in Portugal. You are our special person, your knowledge and understanding of the travel business goes beyond what anybody else can even imagine. You have been our guide and leader for many years now. We trust that our relationship will continue for a long time.